Our Master Planning Study of the campus preceded a general remodeling that was able to capture a number of efficiencies. The Science Department, for example, was spread throughout the building, without good access to storage, preparation space, or expansion for new curricula. The last renovation of the Science Department spaces was in 1967, and the teaching environment was constrained. Our design efficiently combines all of the Science Department functions into a single “Science Wing.” This included the renovation of 17,800 SF to create 11 dedicated science labs designated for specific curricula, such as Physics, Chemistry, General Sciences, and Forensics. It also addressed needs for a growing Science curriculum that included specific lab layouts, integration of new technology, and safe preparation and storage areas. The renovation had to occur within the footprint of the existing building and had to be completed in 42 days during a single summer. 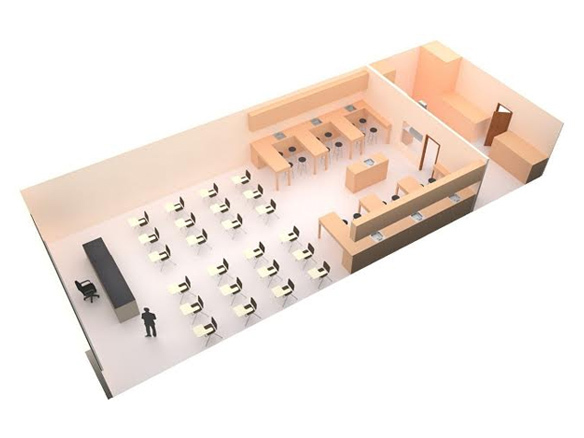 Construction of the Science Wing required relocating various other classroom spaces. Through the Master Planning Study, a solution was found that successfully relocated all users with equal or better spaces within the existing footprint of the building while providing the additional area needed to achieve all the goals established in the Program. The construction window of 42 days was a major challenge but our Construction Management team was continually present to address issues in the field and prevent delays. The project was completed on time and on budget and opened successfully the first day of Fall semester classes, 2011. The new Science Wing has been well received. Students are enthusiastic about their new Science labs, and faculty have been able to incorporate new directions in curriculum due in part to the versatility of the adjustable stations, increased counter space for experiments, and the improved interaction between classes created by consolidating the Department into one area. Class time is now able to be fully dedicated to instruction thanks to localized prep and storage areas. A favorite design component of both the faculty and students is the Periodic Table set into the floor of the main Science Wing corridor. It defines the space and gives an identity to this area of the building. A month after the new Wing opened, student volunteers under the direction of the Science faculty held an open house to the public to show how the new spaces enhanced their education. It was a wonderful celebration of a renewed focus on science education, and was a great way to share the excitement with the community.